Allurigem Journal - What are the 4 C's of Diamonds? Diamonds are one of the most beautiful and precious stones around, but they are not all created equal. The value of a diamond is determined by the 4C’s: Carat, Color, Clarity, and Cut. Reading up on these standards will help you break down the science behind the sparkle. A diamond is measured in carats, but that does not represent its dimensions; it refers to the weight of the stone. While a diamond that is larger in appearance may cost more than its smaller counterpart, its value is based on its carat weight. At first glance, diamonds may look completely clear, but stones that are actually colorless are quite rare. Color is graded on an alphabetical scale from D to Z, with D being colorless and Z being light yellow or even a brownish hue. Nearly colorless diamonds, falling between G and J on the grading scale, are more readily available and are considered clear to the naked eye. Each diamond is unique and has its own identifying naturally occurring characteristics within the stone or on the surface called inclusions. Clarity is graded on a scale from Flawless to Included. Like a colorless diamond, a flawless diamond is also quite rare. Stones that are graded SI2 or higher (Slightly Included) have inclusions that are not visible without 10x magnification and look amazing in an engagement ring as well. While the cut of the diamond sounds like it may refer to its shape (princess, round, oval, etc. ), it actually refers to the quality grade of the angles cut into the diamond to maximize brightness, fire, and scintillation or how “brilliant” a stone is. A stone with a grade of “excellent” has the maximum light return through the diamond. Some terms you may see when reviewing the cut of the stone would include depth, culet, table, and girdle. 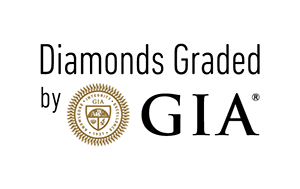 All of our diamonds are chosen using the GIA Diamond Grading Scale and the 4 C’s. Read more about our center stones here.